A Set of THREE MINT/Hardly Used Matching Sony Surround Sound Speakers! With a 120 Watt Center Channel, & Two Front 100 Watt Surround Sound Speakers, Giving Great Sound, as a Matched Package! Located in Torbay. 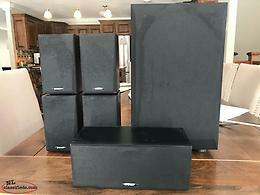 Onkyo Set of THREE Matched Surround Sound speakers. MINT! Everything works great and nice sound. Hi, I'm interested in the 'Sony Surround Sound Speakers. Matching Set of THREE' posted on NL Classifieds! Please contact me if still available.